The Mainboard is a crucial part of any computer system and has every important internal components connected to it. In computer terminology, the mainboard has many other names such as the system board, the logic board or the motherboard, and is commonly abbreviated as MB or mobo. 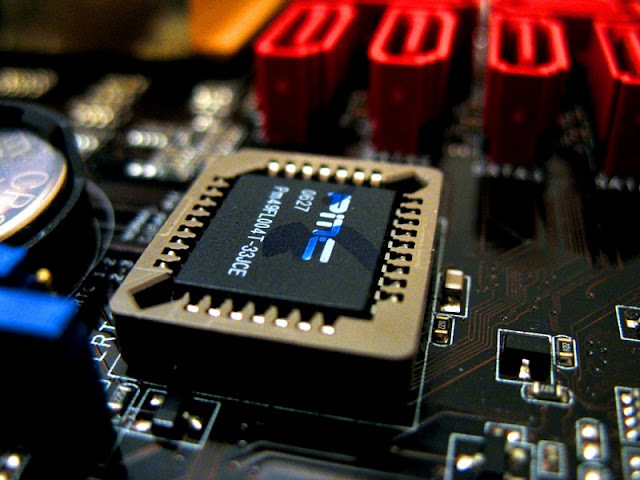 Though the mainboard doesn’t increase the speed of a PC, it is considered as one of the most critical components of a computer system as it connects all the parts that are responsible to help the computer system work. Sometimes, the mainboard is also known as the backbone of the computer where other parts can be put together via slots or sockets. This component may have an AGP or Accelerated Graphic Port that is used to connect to an AGP video card, and IDE or Integrated Drive Electronics interfaces for optical drive as well as hard drives. Besides, it may also contain Peripheral Components Interconnect (PCI) for network cards and video cards in addition to containing many ports for external peripherals such as printer, keyboards, mouse, monitor, speakers etc. In addition, the mainboard contains a BIOS chip that is responsible for checking the computer hardware like the hard disk drives or the power supply unit for malfunctions. Besides performing the hardware check, the BIOS chip is also responsible to power up the CPU of a computer. Normally, the BIOS or Basic Input/Output System is the first program that a computer runs before loading the operating system when you turn it on. In certain cases you may need to replace the BIOS. In order to do this you first need to locate the BIOS chip on the mainboard. The first step is to open up the computer in order to start inspecting the mainboard. Usually, most mainboards have 4 to 5 screws which are responsible to protect the removable cover toward the front panel as well as the base frame. Make sure to unplug the power cable before you attempt to open up the computer case. Click here to see some interesting details in this regard. Once opened, the mainboard lets you view all the internal components of the computer it has. The mainboard is the main flat board inside the circuit where other smaller boards are attached. When it comes to desktop enclosure, the mainboard is built up in the bottom of the computer case while in a tower; it is mounted on one of the sides. The BIOS chip looks like a 32-pin chip indexed within a socket. Older legacy chips, on the other hand, may come with 28 pins which are gathered in a socket. You can also identify the chip by a sticker made of a paper, gold or silver and showing the name of the manufacturer. Moreover, this sticker also showcases the code version of the BIOS chip. With this identity mark, you should be able to clearly find out and view the chip. If necessary, you can also disassemble the computer and remove the board to get a clearer and better view of the BIOS chip on the motherboard. Make sure you remove the BIOS chip from the mainboard when reprogramming or replacing the part.